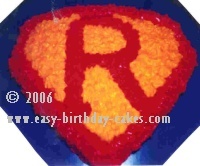 With an icing filled bag and round tip, size #5, draw the superman emblem on the cake surface. You can either draw S for Superman or the child’s first letter of their name. For example, the cake in the picture is for a little boy named Ryan, so I drew an R instead of the S.
You will use a star tip, size #18 to do the entire cake. Make a red colored icing and do the letter and the border and the sides of the cake. Make yellow icing and fill in the background areas. To see more kids birthday cakes . . . If you have made a Superman cake that you would like to share, please submit your cake here and let us know how you made it! We would love to feature your cake on our site. Please make sure to include a photo of your cake and a description of how you made it, so that we can all share ideas and learn from each other! See Superman Cakes That Were Submitted By Others To This Site!